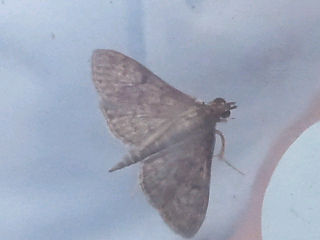 OK...this flower has become a "search a find" for the wheatear stitch! 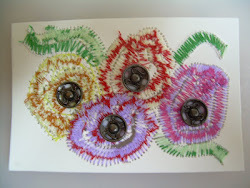 I started each petal with them, but they got camouflaged when I added in more stitches! 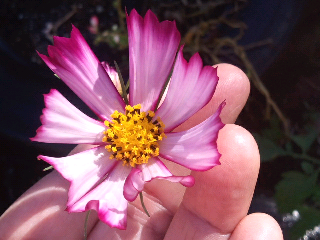 You can see two of the petals unfinished in the pic below, and then the finished flower in the second photo. I have more seeds to add for the finished product, but wanted to get it posted since it is now Friday night! 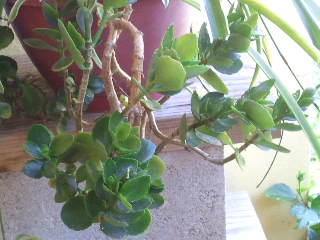 It has scattering seeds (in the wind) spiraling around it. 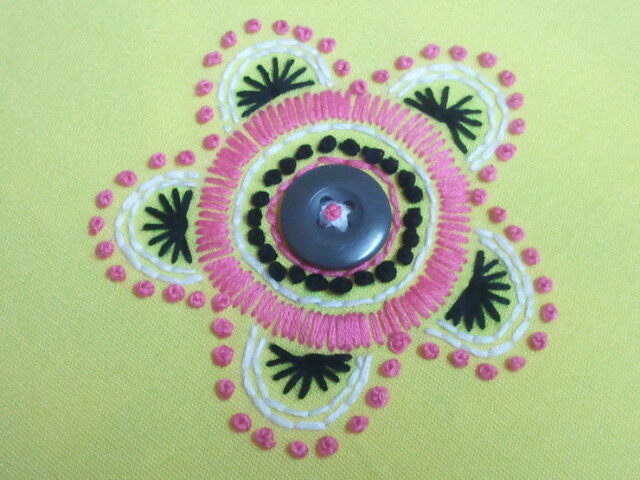 I started with a second found object (a key ring) in the center, which I opened up a bit. Then I couched it to the fabric, and built up from there. 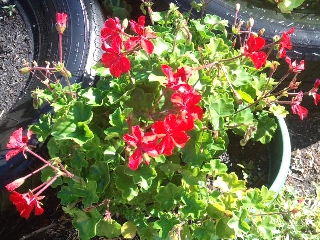 This is a fantasy flower, all from my feeble mind, and the seed idea came, so there you have it! 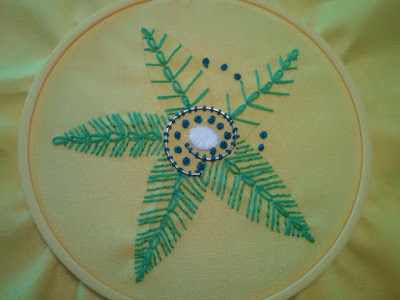 I am linking to Sharon's, Pin Tangle for TAST (Take a Stitch Tuesdays). Come over and join us!!! A few days ago, I took my car into the shop to have a new condenser and other things relating to the a/c replaced...and lo and behold there was a dog that looked so much like Doozey! I asked if they got him from the same breeder, and sure enough they did. We think maybe they have the same mom, and different dads, because they are a year apart and he is much larger and has different colored eyes and nose than Doozey's. Of course, we are only speculating at this point...but we can always pull out our papers and find out. This breeder gave us CKC papers and the parents are listed. I will have to ask them if they still have their papers too. Doozey is on the right being held by my daughter, and Buster is on the left being held by his owners son. It was chilly out and they both had on a little something to keep them warm...LOL. Doozey had to have two teeth extracted yesterday. 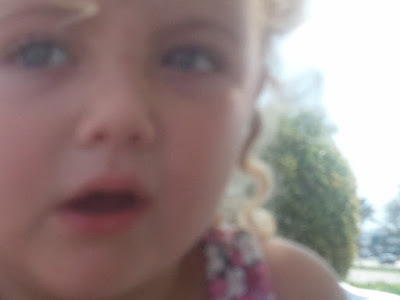 Yesterday she was looking so good afterward (due to the local anesthetic she was given), but this morning, she woke up with pain. She has had her pain medicine, eaten breakfast (soft food only for a few weeks), and now she is acting and reacting to everything just like usual!!! I guess she has pulled through it so far, so good. We have the worlds greatest vet. Thank God. I still have a few days to go until I make sure her infection is gone and she has healed completely. She was on antibiotic for a week prior to surgery and now a few more days of it. She had some IV antibiotic too, so I think she will be good as new really soon. Here is my small haul of eggplants this morning...funny some are yellow this time. 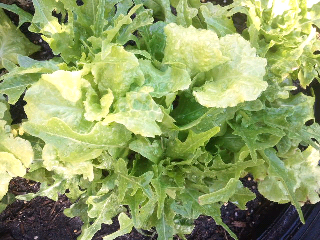 I am going to mix these babies up in a skillet with other vegetables today and chomp em down!!! 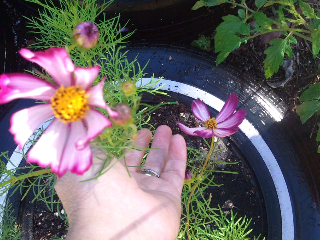 I was out watering this morning, and found one bunch of lettuce could be a bridal bouquet, my red geranium was blooming so prettily, a tomato was turning red, that i am overloaded with lettuces, the Cosmos is sweet, and my kalenchoe just looked so beautiful to me....so i had to take pictures! 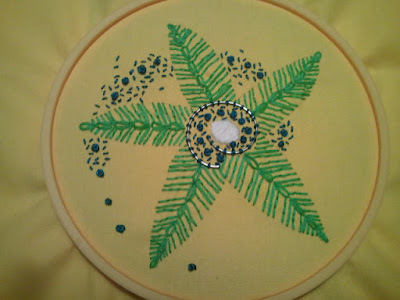 This week, Sharon, over at Pin Tangle proclaimed a challenge to create an embroidery using french knots. I wanted to try this week, and here is my final product. I think it turned out rather good. It was inspired by a book titled Creative Needlework, by Solweig Hedin and Jo Springer. The front cover featured a work very similar to this, which I added my own changes to. 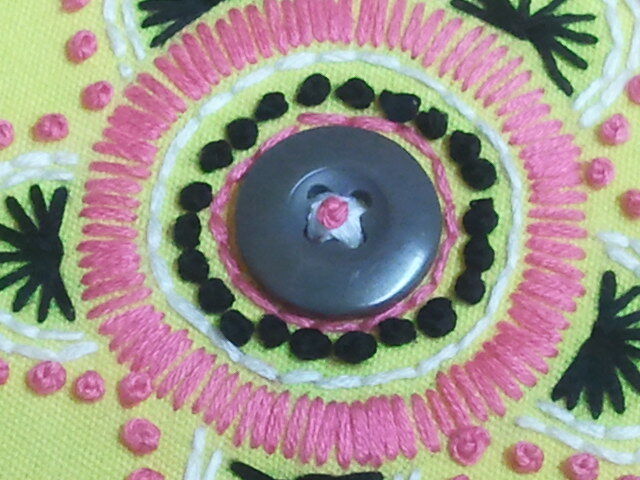 The button in the center was a found object from a few days ago, and I decided to feature it in the center of whatever I did. I wanted to show how you can take a rather boring, unexciting object, and really change it by adding some excitement and fun. When I got all finished, I decided it needed a pink french knot right in the center of the button, and I was able to do that, which I feel really added the perfect touch. 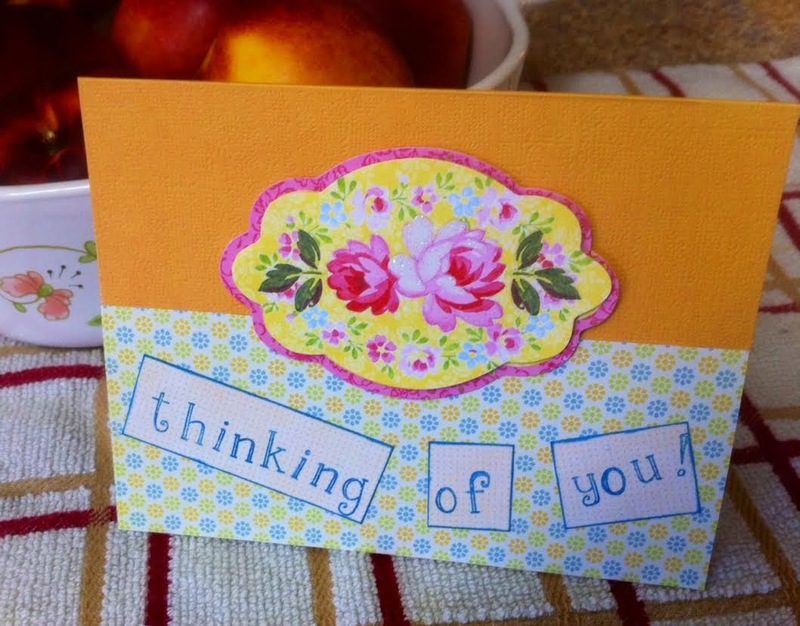 You can find all of the other participants of Take A Stitch Tuesday, over here at Pin Tangle. These pictures (taken by my DIL this evening), stop time for a second, and makes you realize how grateful you are for EVERYTHING!!! 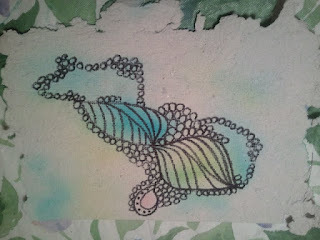 Just a little try at something fun that I learned from my friend, Teri over at Painted Daisies. Hers was so pretty, and more of a traditional zentangle. She took a piece of already watercolor splashed paper and added to it with pen. Mine is light (my pen was running out somewhat), and the homemade paper had such a rough surface, it couldn't grab all of the Sharpies ink. Still kinda cute, eh??? Looks nice on top of the tablecloth as a background. Life here is rather boring. Just waiting the next 3 weeks to hear about the job I interviewed for. I have been trying to take care of everything that needs (as much as I can anyway) prior to going back to work. Doozey's toenails got trimmed today, and she got a bath. To the vet tomorrow for yearly check up and shots. Then it will be cat's turn. 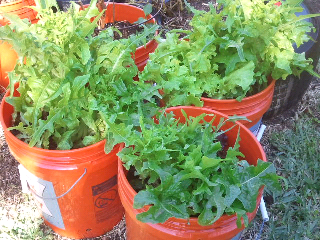 I have made a decision not to do a vegie garden for the summer. 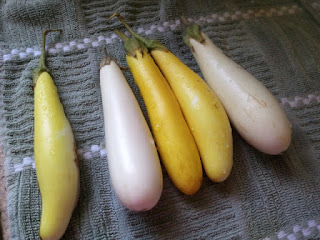 It is just so hot here, and all I can grow is eggplant and my beloved okra. 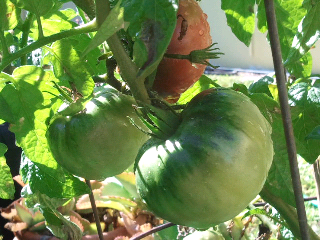 The eggplant is already going and these plants live three straight years (producing non-stop)...so I will just manage the one plant for the summer. My Mom and I have decided that it is far easier to buy fresh okra at the market...sadly. 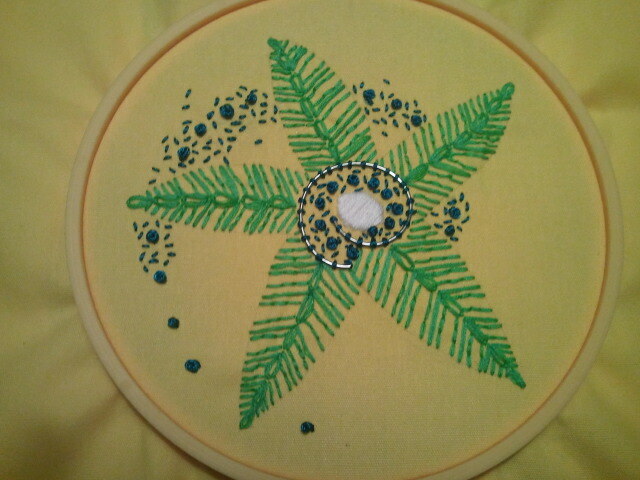 I sure wish I could find time to sit and keep practicing my embroidery...it is hard. I like the free style of just a practice cloth, but I am also thinking it would be neat to try and make a gift of something embroidered. Any ideas on what would make a good gift for a beginning embroiderer to try????? I have discovered a whole genre of books I never knew existed! 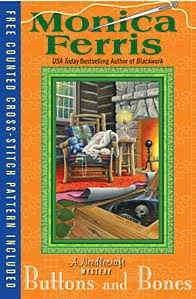 I had heard the term "cozy mysteries" before, but never paid much attention because I have always read non-fiction (mainly)...but one day I came upon one of these books. 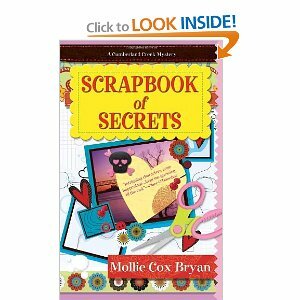 The first one was called Scrapbook of Secrets...a book that involves a mystery and revolves around a scrapbooking theme!They concentrate on the mystery rather than gore or suspense, and are often light-hearted or funny. My next book was Monica Ferris' book called Crewel Yule! This was fun as it revolved around stitchers! The book also includes a crewel pattern. She has multiple stitchers themed books...and I can't wait to read them all. 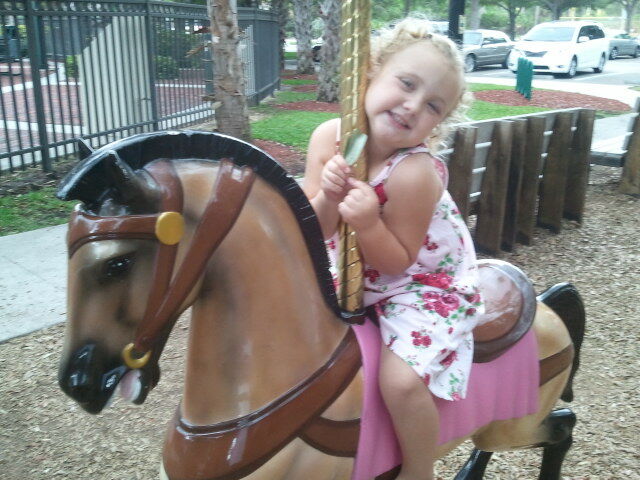 They are so much fun!!! 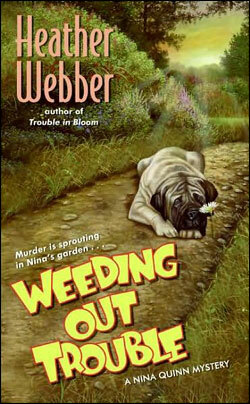 I just found this book at a local used book store called Weeding out Trouble, a gardening cozy mystery. She also has multiple titles involving this subject. Below are cozy mystery writers organized by theme. Stefanie Matteson: Charlotte Graham Mysteries. Sue Henry: Maxie McNabb Mysteries. Mignon Franklin Ballard: Augusta Goodnight Mysteries (yup, she's an angel.). Lydia Adamson: Dierdre Quinn Nightingale Mysteries (vet). Donna Andrews: Meg Langslow Mysteries (birds). Cynthia Baxter: Reigning Cats & Dogs Mysteries. Jessica Speart: Rachel Porter Mysteries. Karen Ann Wilson: Samantha Holt Mysteries (vet). Ann Campbell: Annie O'Hara & Claudius Mysteries. Tamar Myers: Den of Antiquity Mysteries. Lea Wait: Antique Print Mysteries. Elizabeth Peters: Amelia Peabody Mysteries. Heron Carvic & Hamilton Crane: Miss Seeton Mysteries (retired art teacher). Aaron Elkins: Chris Norgren Mysteries. Find books! Elizabeth Peters: Vicky Bliss Mysteries (art historian). Jill Churchill: Grace & Favor Mysteries. 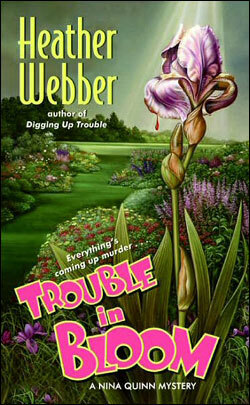 Jean Hager: Iris House B&B Mysteries. Tamar Myers: Pennsylvania Dutch Mysteries. Tim Myers: Lighthouse Inn Mysteries. Barbara Burnett Smith: Kitzi Camden Mysteries. Sarah Strohmeyer: Bubbles Yablonsky Mysteries (although she's actually a reporter). Carolyn Hart: Annie Laurance & Max Darling Mysteries (bookstore owners). Joan Hess: Claire Malloy Mysteries (bookstore owner). Kathryn Lasky Knight: Calista Jacobs Mysteries (children's book illustrator). Frances & Richard Lockridge: Mr. & Mrs. North Mysteries (publisher). Janet Evanovich: Stephanie Plum Mysteries. Lawrence Block: The Burglar Who Mysteries. Lydia Adamson: Alice Nestleton Mysteries. 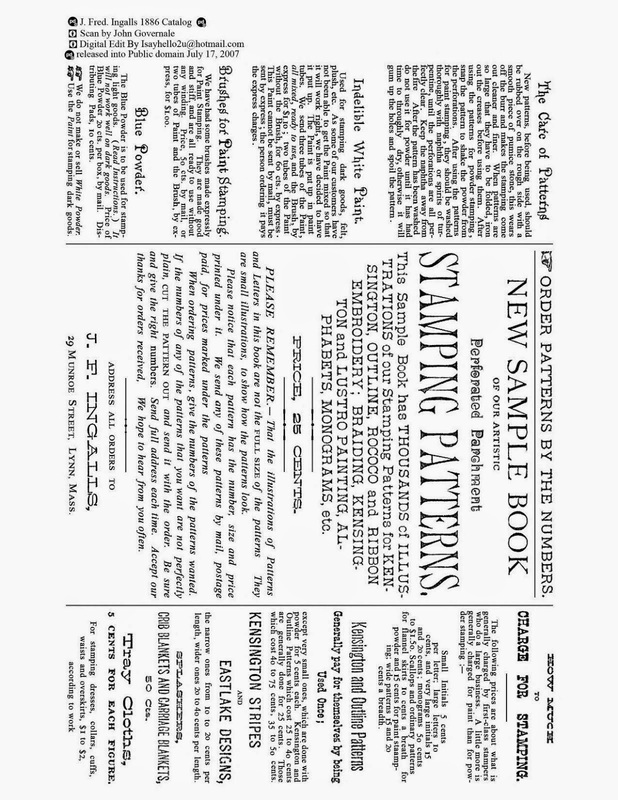 Marian Babson: Perkins & Tate Mysteries. Lilian Jackson Braun: Cat Who Mysteries. Carole Nelson Douglas: Midnight Louie Mysteries. Leann Sweeney: Cats in Trouble Mysteries. Camille Minichino: Periodic Table/Gloria Lamerino Mysteries. Donna Andrews: Turing Hopper Mysteries. Sally Chapman: Silicon Valley Mysteries. Avery Aames: Cheese Shop Mysteries. Riley Adams: Memphis Barbecue Mysteries. 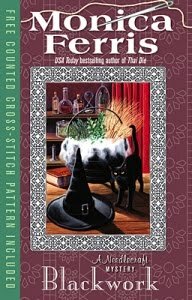 Susan Wittig Albert: China Bayles Mysteries (Herbs). Claudia Bishop: Hemlock Falls Mysteries. Joanna Carl: Chocoholic Mystery Series & Hannah Swensen Mysteries. Laura Childs: Tea Shop Mysteries. 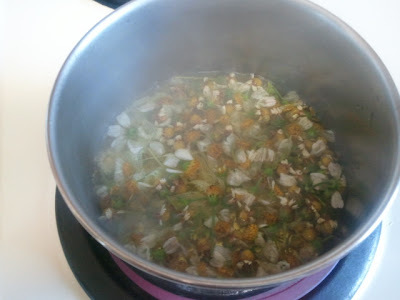 Diane Mott Davidson: The Goldy Bear Culinary Mysteries. Krista Davis: Domestic Diva Mysteries. Jerrilyn Farmer: Madeline Bean Catering Mysteries. Julie Hyzy: White House Chef Mysteries. Cathie John: Journals of Kate Cavanaugh. Joanne Pence: Angie Amalfi Mysteries. 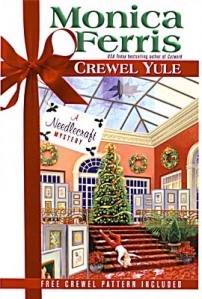 Nancy Pickard: Eugenia Potter Mysteries. Phyllis Richman: Chas Wheatley Mysteries. Lou Jane Temple: Heaven Lee Culinary Mysteries. Livia J. Washburn: Fresh Baked Mysteries. Wendy Watson: Ice Cream Mysteries. Melinda Wells: Della Cooks Mysteries. Penny Warner: Connor Westphal Mysteries. Dorothy Cannell: Ellie Haskell Mysteries. Paula Carter: Mysteries by Design. Jill Churchill: Jane Jeffry Mysteries. Denise Osborne: Feng Shui Mysteries. Laurien Berenson: Melanie Travis Mysteries. 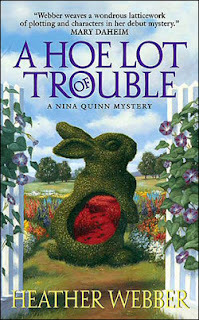 Ann Campbell: Annie O'Hare & Claudius Mysteries. Melissa Cleary: Jackie Walsh Mysteries. Susan Conant: Rowdy and Kimi Mysteries. Sue Henry: Maxie and Stretch Mysteries. Leslie O'Kane: Allie Babcock Mysteries. Ellen Byerrum: Crime of Fashion Mysteries. Nancy J. Cohen: Bad Hair Day Mysteries. Victoria Houston: Loon Lake Fishing Mysteries. David Leitz: Max Addams Fly-Fishing Mysteries. Janis Harrison: Bretta Solomon Mysteries. Rett MacPherson: Torie O'Shea Mysteries. 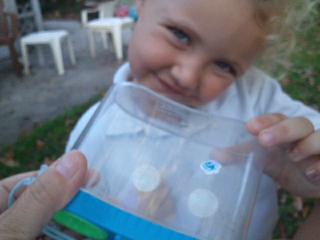 Charlotte & Aaron Elkins: Lee Ofsted Mysteries. Roberta Isleib: Golf Lover's Mysteries. Gerald Hammond: Keith Calder Mysteries (gunsmith). Sandra Scoppettone: Faye Quick Mysteris: (1940s NYC). Victoria Thompson: Sarah Brandt Mysteries (1890s NYC: midwife). Jacquelin Winspear: Maisie Dobbs (1920s London: psychologist). Sarah Graves: Home Repair Is Homicide Mysteries. Hannah Dennison: Vicky Hill Mysteries (obituary writer). Carola Dunn: Daisy Dalrymple Mysteries. Sarah Strohmeyer: Bubbles Yablonsky Mysteries. Roberta Isleib: Advice Column Mysteries. Karen E. Olson: Annie Seymour Mysteries. Claire Daniels: Karma Crime Mysteries. Stephanie Barron: Jane Austen Mysteries. Carrie Bebris: Mr. & Mrs. Darcy Mysteries. Carolyn Hart: Death on Demand Mysteries (bookstore owners). Evan Marshall: Marshall, Evan, Jane Stuart and Winky Mysteries. Marlys Millhiser: Charlie Green, Literary Agent Mysteries. Hernon Carvic: Miss Seeton Mysteries. Agatha Christie: Miss Marple Mysteries. Jeanne M. Dams: Hilda Johansson Mysteries. Charlaine Harris: Lily Bard Mysteries. Susan S. James: Flip Paxton Mysteries. Barbara Seranella: Munch Mancini Mysteries. Alys Clare: Hawkenlye Medieval Mysteries. Sara Conway: Lord Godwin Medieval Mysteries. P. C. Doherty: Hugh Corbett Medieval Mysteries. Margaret Frazer: Dame Frevisse Medieval Mysteries. Viviane Moore: Chevalier Galeran Medieval Mysteries. Ian Morson: William Falconer Medieval Mysteries. Sharan Newman: Catherine LeVendeur Mysteries. Ellis Peters: Brother Cadfael Mysteries. Leslie Meier: Lucy Stone Mysteries. Earlene Fowler: Benni Harper Mysteries. Sara Hoskinson Frommer: Joan Spencer Mysteries. Mary Jane Maffini: Charlotte Adams Mysteries. Nancy Atherton: Aunt Dimity Mysteries (ghost detective). E. J. Copperman: Haunted Guesthouse Mysteries. Charlaine Harris: Southern Vampire Mysteries. Victoria Laurie: Psychic Eye Mysteries. Parnell Hall: Puzzle Lady Mysteries. Elizabeth Zelvin: Bruce Kohler Mysteries (recovering alcoholic). Terence Faherty: Owen Keane Mysteries. Margaret Frazer: Sister Frevisse Mysteries. Ralph McInery: Father Dowling Mysteries. Sister Carol Anne O'Marie: Sister Mary Helen Mysteries. Peter Tremayne: Sister Fidelma Mysteries. Ashley Gardner: Mysteries of Regency England. Dawn Aldridge Poore: Miss Sydney Regency Mysteries. Joan Smith: Regency Romantic Mysteries. Terri Thayer: Stamping Sisters Mysteries. Although old sleuths are not a new thing, these series deal with the theme of aging (usually humorously). Sherry Lewis: Featuring Senior Sleuth Fred Vickery. Alina Adams: Figure Skating Mysteries. Anne George: Southern Sisters Mysteries. Patricia Sprinkle: Thoroughly Southern Mysteries. Karen E. Olson. Tattoo Shop Mysteries. Linda French: Professor Teodora Morelli Mysteries. Louise Shaffer: Daytime Crime Mysteries. Gar Anthony Haywood: Joe and Dottie Loudermilk Mysteries (retired & travelling). Maddy Hunter: Passport to Murder Mysteries (tour guide). Sally Spencer & Alan Rustage: Victorian Mysteries. This list was found at Browsers Bookstore, where you can also purchase them. I would like to give a big thank you to this company for having this list. I have no affiliation with them what so ever. I will use it to add as I find more. Other places to find them are at your library, used and new bookstores, and of course, e-books. I have been so kindly given a blog award by my pal, Bobbie Lynn over at Why I Love To Garden, called the Leibster. I am supposed to award 5 people now, to spread the love,...but I want to extend it to everyone on my bloglist who have a following of 200 or fewer (one of the rules), as I think you are all devine! 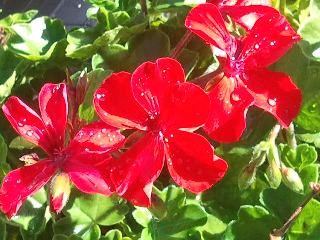 :) Please take it and enjoy!!! 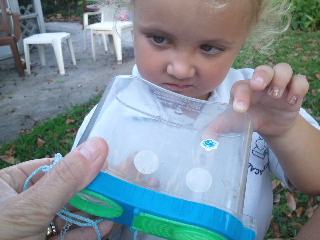 Emily is studying bugs in school, so several times a day we catch and release. 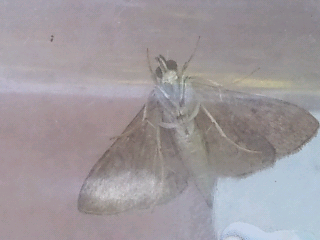 Here is one capture...a little moth flitting about in the grass. 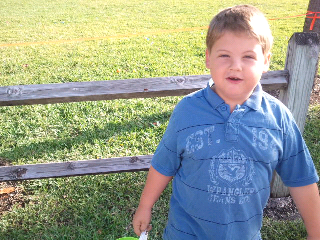 The kids had a great Easter. If but we dwell together". I found this little ditty while reading some poetry. Sweet. Unknown author. 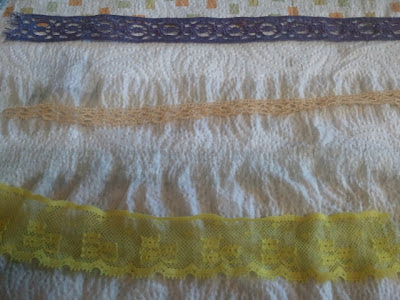 A few days ago, I decided to pick up a few things around the neighborhood to use as dying agents, to do some sample lace dying. 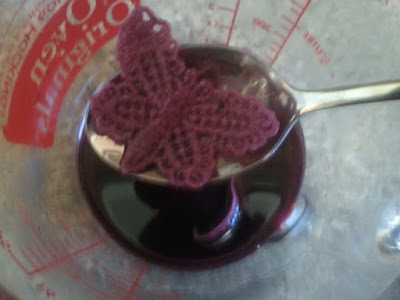 For both batches I used equal parts of water to material, added a tablespoon or so of vinegar (to make it permanent), heated to a slow boil, and let sit with white lace dropped in, for a few hours! First up was some of the Sea Grape leaves that were falling out of my neighbors tree! Here they are in my sink. 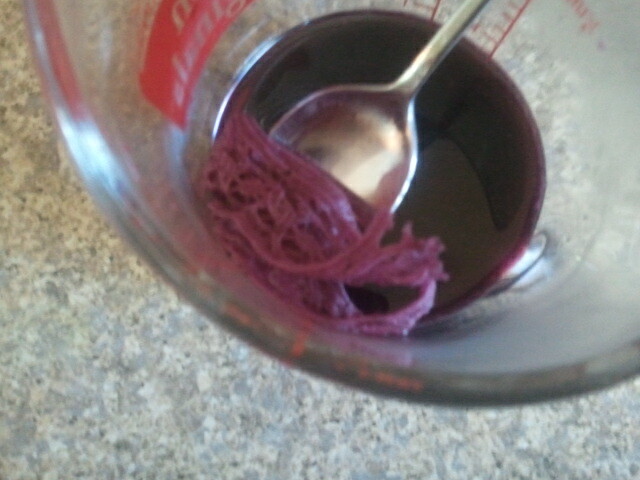 I washed them and broke them up, put them in my VitaMix and made a blenderized water/vinegar solution. The next batch were little white weed flowers that has very bright yellow centers. I thought it would make a pretty shade of yellow. 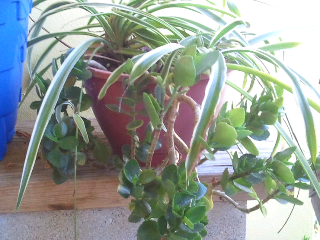 Here is that potful. I was right...they yellow turned out very pretty! 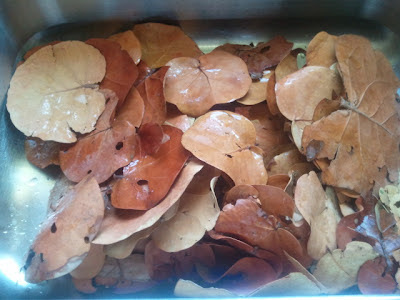 The Sea Grapes made a lovely shade of champagne beige!!! Here you see the three laces I have done so far. 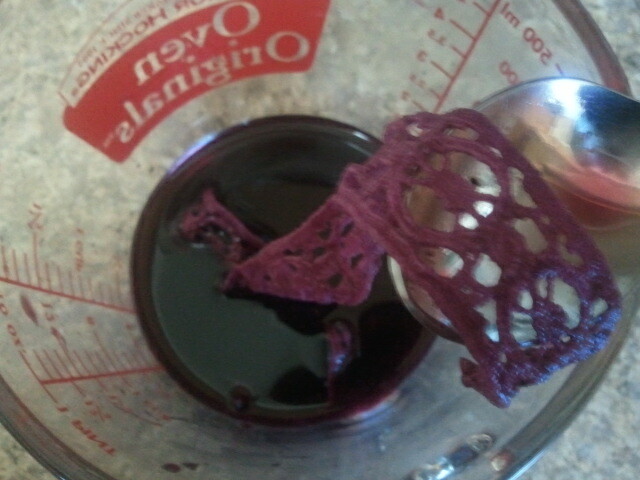 The top purple one had been done previously with blueberry juice. 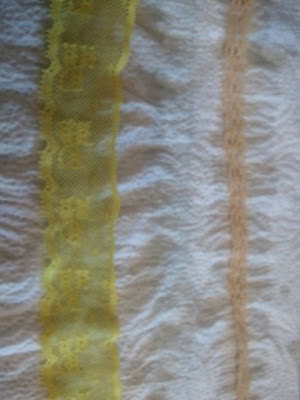 All of these laces started out as white. This is really kinda fun!!! What to do with them??? Use in stitcheries, as a trim on anything, or in collages. Now, if I just had time for all those parts!!! LOL. 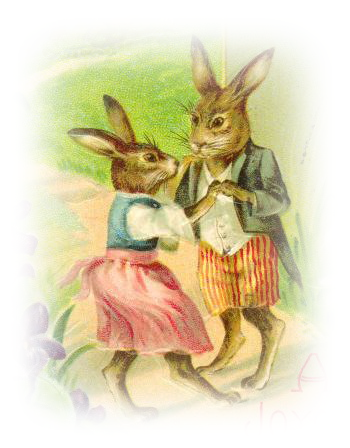 OH...and Happy Easter to all who celebrate! Good news, dying lace experiment with natural food dye, and a cute girl! OK...first the good very exciting news for me! I received the letter today from the library that I have been selected for an interview!!! It has been about 4 weeks since I first applied! Kind of a slow process, eh??? I am ultra excited anyway, and am planning to make the break into a new career, if I can. We won't be poor, we just won't be as rich as we used to be (financially). Still rich in love, and that is all that matters to me. 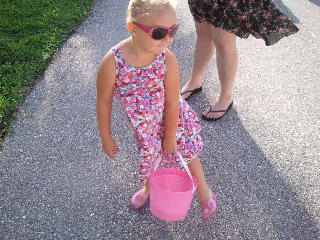 Yesterday the grandkids, DIL, daughter and I went to a few parks in Boca Raton, and here is Emily in her new dress from H & M. Such a doll!! !